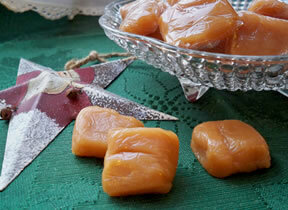 The anise extract provides these caramels with a sweet licorice flavor that is hard to resist. 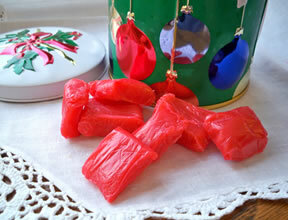 When colored in red, these caramels make a colorful addition to your holiday treats. 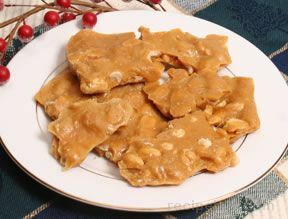 They are a delightful change from traditional caramels that will leave a lasting impression. Generously grease a 10 x 15 stoneware pan or a jelly roll pan. In a saucepan, melt the butter over low heat; and then add the sugar, sweetened condensed milk, corn syrup, and salt. Mix well and cook over medium heat, stirring frequently. Cook until the mixture reaches the firm ball stage or until it reaches a temperature of 244 degrees F. Be sure to stir frequently because the mixture will scorch easily. Remove from the heat and add the anise extract and coloring paste; mix well. Pour into the greased pan. Cool slightly and then quickly flip the pan over onto a greased working surface. 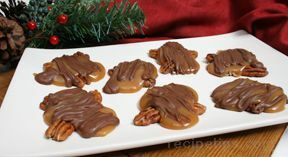 Allow it to cool just long enough so you can handle it; then cut the caramels to the desired size. Using a greased scissors works well to cut the caramels. After cooling completely, wipe off the excess grease with a paper towel and then wrap the caramels in pieces of plastic wrap. "These were a lot of work but soooo worth it. If you want to try something different in a caramel, try this recipe. Our family loves them."